An experiment in journalling and distributed communication. Play with expensive camera gear! 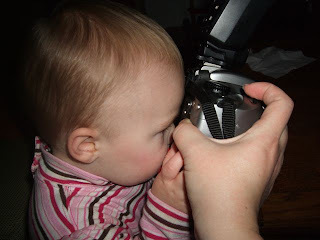 Initially, Margot picked up my big camera, held it upside-down and pressed her face to the back. I exercised more restraint than usual by not just running straight for another camera to take a picture with. So, here's a reenactment that has the expensive camera gear well supported by my grownup hands.